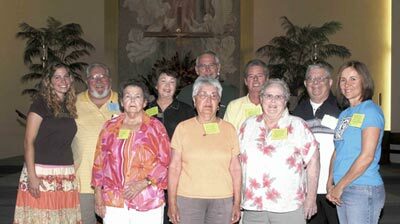 OLA Ventura Prayer Group - "New Hope Springs Forth"
The parish prayer group at Our Lady of the Assumption in Ventura had stopped meeting for a number of years. It seemed that charismatic group prayer experiences were becoming little more than a memory of times past. 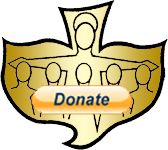 Was the mission of charismatic renewal completed and over with? Or did God the Holy Spirit have more? Deacon Jim Farley, a former prayer group leader in the parish, received a "prompting" earlier in the year to revive the prayer group. The decision was made to conduct a Holy Spirit Seminar and hopefully jumpstart the prayer group. A dedicated team of charismatic veterans were assembled and together they stepped out in faith to organize and promote the seminar. Everybody was wonderfully amazed when approximately 100 people showed up on a September evening to spiritually learn more about the personal workings of the Divine Trinity. The presence and power of the Holy Spirit was evident throughout the nine week format of the Thy Kingdom Come Seminar experience. The following testimonial comments are from some of the Seminar participants. "I received assurance that I am God's child and creation and that in my daily journey, if I have the cross and Jesus in front of me, His love guiding me will surely lead me home." "The seminar brought focus into my life and heart, the third person of the Holy Trinity." "I must admit I didn't think a seminar could be done. We were too new, too small, etc...but the Spirit knew better. Those nine weeks were the most Spirit-filled of my life. I could feel the Holy Spirit working in me, opening up a whole new prayer life to explore. I would guess very few people attending did not sense the presence of the Holy Spirit." "The manifestation of the Spirit was evident in the small discussion group of which I was a part." "The choice of presenters and the substance and delivery of the Spirit through them was vital. Nor can enough be expressed of the importance of the music ministry. OLA is blessed with Jackie and Aaron, who are trying mightily to teach a bunch of Catholics, cradle and otherwise, to sing (pray)." "The Holy Spirit seminar was a time of renewal and revival for me. The full 9 weeks was a tough commitment for all, but the Lord never disappoints and in fact He gives so much more than we ever expect!" "It was the first time my husband had ever experienced Charismatic prayer and it was a blessing to have him a part of it. What stands out for me, as I look back, is the love that was pouring out from the many willing attendees when we prayed over one another for healing each week. Those who had never experienced the laying on of hands and being surrounded by loving prayers in this way were drawn to it by the Holy Spirit's touch and then in turn began to pray over others. Everyone seemed to want to give the love received back to others." "One woman was diagnosed with breast cancer and was going to have exploratory surgery. We prayed over her. She seemed to be filled with peace after many loving hands laid on her praying for God's mercy and love upon her. The next week she returned and said that the surgery was a success and that there was just a very small area that they would be able to treat and that she would not have any extensive surgery! She attributed the good news to prayer and was beaming with joy!"